Post-graduate students and academic staff from the Department of Zoology, The University of Melbourne, have been conducting a research program on the ecology and management of Anglesea’s kangaroos since 2004. 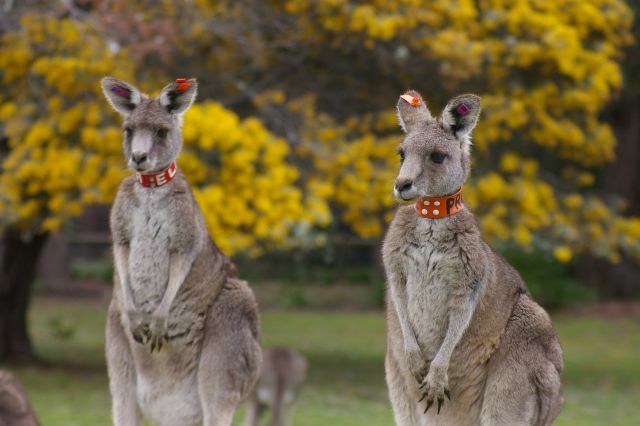 This research has focused on the Anglesea Golf Club, and nearby Camp Wilkin, where over 300 kangaroos have been captured, examined, numbered and named, then marked with ear tags and collars. 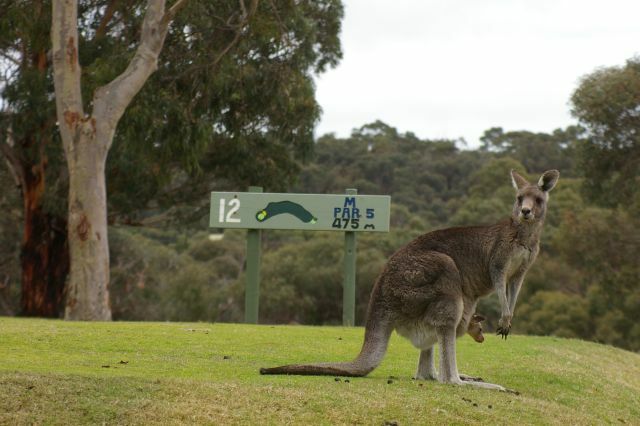 With the help of Golf Club staff and many Anglesea residents, these markings have allowed researchers to build up a detailed picture of the lives of each kangaroo. Additional information about this research can be found on the Anglesea Golf Club web site. The kangaroo population in Anglesea is unique. It is rare to find wild kangaroos living in an urban area and so close to people. However, wild populations of kangaroos can pose a challenge for a number of communities around Australia, and conflicts between kangaroos and people were evident in the Anglesea area in 2003. Amongst these concerns was an apparent rise in the frequency of kangaroo road-kills, and a heightened risk of injury to sightseers at the golf course. These concerns led to the formation of the Anglesea and Aireys Inlet Community Kangaroo Plan Advisory Group (KAG) in 2003. This group had representatives from government agencies, conservation groups, private industry and the golf club. A number of activities including an information leaflet, warning street signage, bumper stickers and a postal survey provided a foundation for the preparation of a community-based management plan. 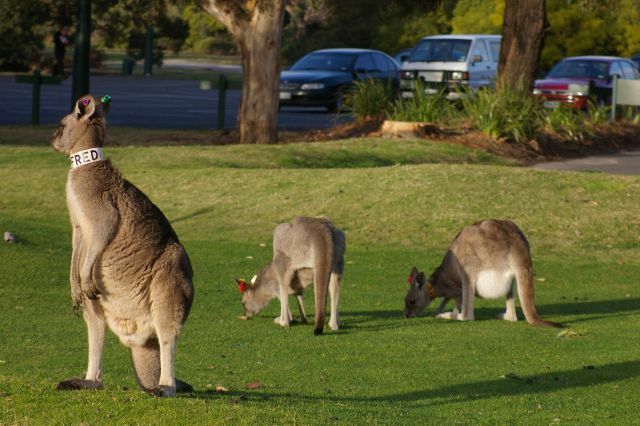 Develop a sustainable coexistence of the kangaroos on the Anglesea Golf Club. More detail can be read in Roo town slow down. University of Melbourne researchers became involved in assessing the kangaroo population, the issues surrounding the town and its kangaroos, and the development of the kangaroo management plan. How many kangaroos live on the golf course? The Eastern grey kangaroos on the golf course are highly habituated to humans. This provides a rare opportunity to observe and study Eastern grey kangaroos up close. 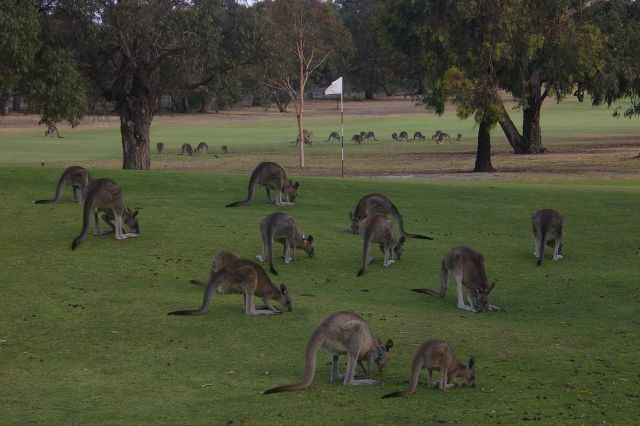 When research began in 2004, around 360 kangaroos were living on the golf course. The population changes in size throughout the year, as most of the large males leave the course during winter (non-breeding season). The population on the golf course is the highest density ever recorded for the species. Since then, fertility control has been tested to prevent some female kangaroos from breeding. The contraceptive implants are the same as those used in humans and generally prevent reproduction for a couple of years. Females resume breeding normally once the hormonal implant has worn off. Currently, the population is sitting at around 230 kangaroos, but it varies depending on the season with most adult males leaving the golf course in winter. The Alpha male is named ‘Earl’ and he weighs around 73 kg, 10 kg more than the next heaviest male. He regularly moves around the entire golf course to keep an eye on all the females (and his competition!). He has been fitted with a radio collar so that researchers can work out where he lives when he is not on the golf course. 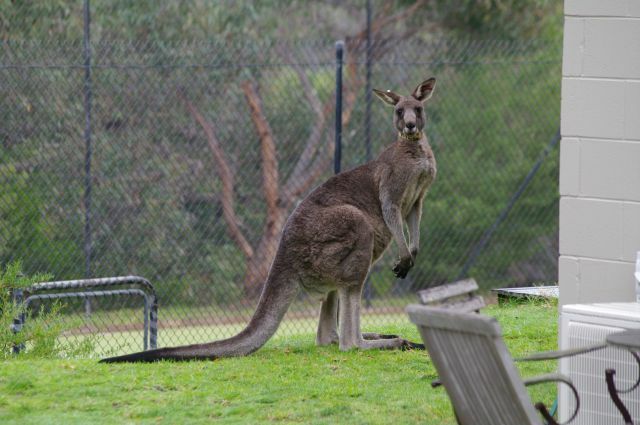 He has been spotted by locals at the caravan park and behind the tennis courts. What are those tags and collars? 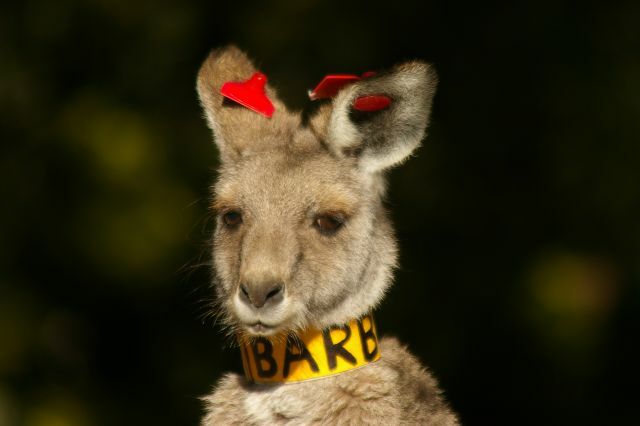 The tags and collars allow researchers to monitor the kangaroo’s movements, growth, survival and reproduction. Many of these ecological measurements have not been fully studied in free-ranging kangaroos, despite them being an Australian icon! Marking individuals means that they (and often their offspring) can be followed throughout their life. While collecting general information about the size of the population and the survival of individuals, researchers are also interested in looking at where members of the population spend their time (often based on community reports), whether juveniles stay close to their mothers or move off once becoming independent, effects of parasites on kangaroo health and behaviour, reproductive strategies and frequency of road-kills. Being artificial in nature, Anglesea also makes a very interesting site for comparison with other more natural kangaroo populations. The other benefit of having individual names on collars and identifiable tags, is that they can allow the involvement of the general public (particularly children) as citizen scientists, and increase public awareness and knowledge of research that is being undertaken. What research questions have been answered? Read some of the answers here.